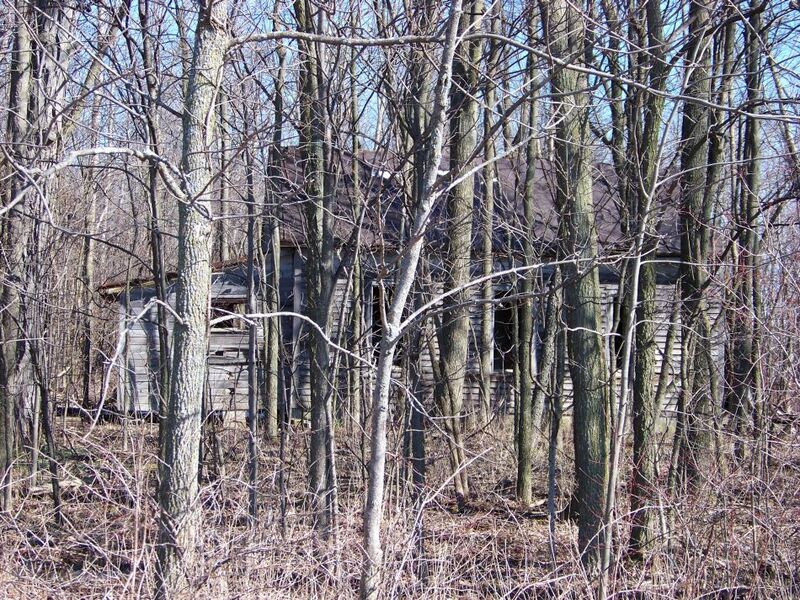 If you look closely through the trees and the undergrowth, into this woods on Schaadt Road near Chattanooga, Ohio, you can barely see an old frame building. You can see it when the trees are bare but it will be nearly hidden by the middle of summer. This old structure used to be the Chattanooga barbershop. 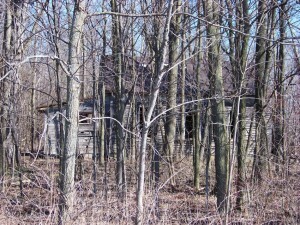 It is hard to say how old this frame building is or when it was moved into the woods. It was once located north of Fisher’s Hardware, between the homes of Luther & Gladys Fisher and Carl & Marcella Schroeder, on the west side of State Route 49. Some people think it was moved to the woods by WWII. It was evidently moved to serve a new purpose–as a family dwelling. In the 1950s the old barbershop was home to Ester Baker and her family. It was painted white back then, but all the paint has worn off, exposing the bare wood. This was the second building that I know of that was moved out of town once its original purpose had ended. Zion’s old frame church was moved to the north end of Chatt when the brick church was built in 1917. The frame church was then used as a garage for many years but is no longer standing. I checked the 1916 Farm Journal Directory of Mercer County but there were no Chattanooga barbershops listed in it. However, in that same directory William Koch of Liberty Township gave his occupation as a barber. William Koch was enumerated as a barber in the 1920 census, too. He was 57 years old and born in Germany. 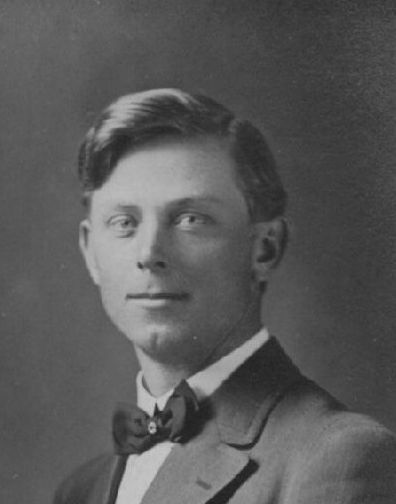 Darrel Wilson gave his occupation as barber when enumerated in the 1930 census. He was age 26 and born in Ohio. Perhaps they worked in this frame barbershop in Chatt. Some people recall other barbers that were employed at the little barbershop. Among them were Jacob Duff, Carl Schroeder, Howard Caffee, Frank Mikesell and Hershel White. Carl Schroeder is probably the best known Chattanooga barber. Carl was also a school teacher at the larger of the two Chatt schools. The large school was for grades 4-8. Howard Caffee, one of the Chattanooga barbers. Howard Caffee got his barber credentials and license by passing a test in Indianapolis. Reliable sources say that he learned to cut hair by practicing on the neighborhood kids. 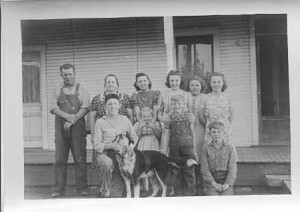 Carl Miller family, front: Herb, Anna Lou, Kenny, Vernie. Back: Carl, Gertrude, Ruth, Helen, Kate, Em. Even though Howard learned to barber on the neighbor kids he was not responsible for the nearby Miller boys’ uneven haircuts. The Miller boys had their own resident barber—their father, my grandfather, Carl Miller. I have it on good authority that he pulled hair and made the whole hair-cutting process rather painful. I can understand why if he used the old pair of rusty trimming scissors we found in the barn last summer. It looks like Grandpa Miller used the bowl-cut technique to cut hair. But apparently he had trouble getting the bangs even. My uncle (the boy to the far right with uneven bangs) said that when his grandson saw the above photo he asked if everyone in the family had been Amish at one time. Note that my dad was wearing a hat. Shave and a haircut—two bits. This phrase is usually recognized as a 7-note musical riff used as a humorous song ending which was also used on the old TV show, The Beverly Hillbillies. Shave and a haircut—two bits. Twenty-five cents may have indeed paid for a visit to the Chattanooga Barbershop several decades ago. The Farm Journal Illustrated Directory of Mercer County Ohio (Philadelphia, Pennsylvania: Wilmer Atkinson Company, 1916), 102. 1920 U.S. census, Liberty Township, Mercer County, Ohio, ED 140, p. 1A, dwelling 3, family 3, William Koch; digital image by subscription, Ancestry.com (http://www.ancestry.com : accessed 11 April 2013); from National Archives microfilm T625, roll 1418. I think Herb was wearing a hat to cover up his haircut? That is a great photo of Grandpa Caffee. I remember your Grandma and Grandpa, but I think I was pretty young when they passed. Hi Deb! Howard’s photo is from their wedding photo. He was a handsome man. My grandparents both passed away in 1973 but I’m sure you remember them since you were neighbors. Great to hear from you! 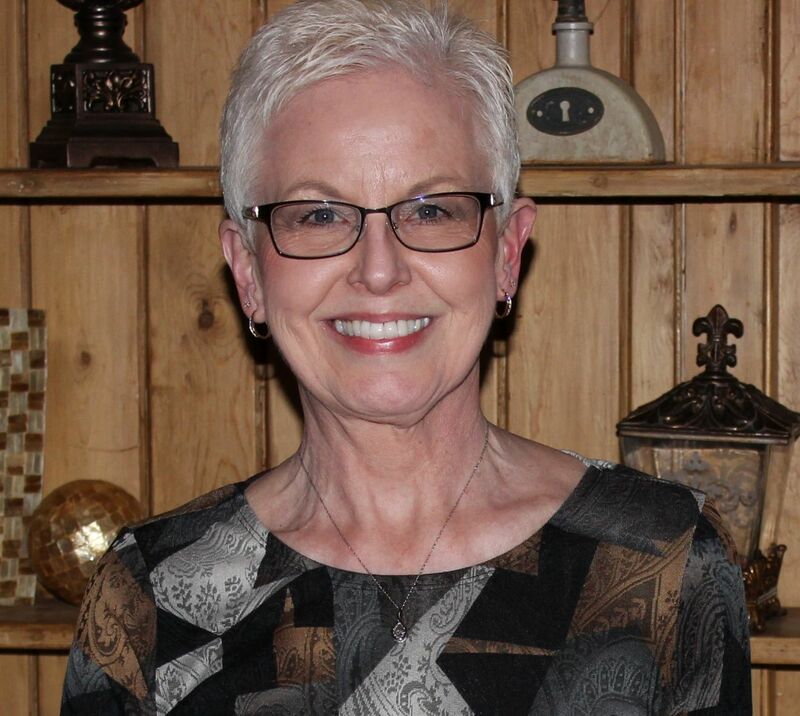 While I have never gotten a hair cut for two bits, and no hair cut at all in Chatt (can not remember ever seeing a barber shop in Chatt, but I can only recall back to about 1955 or so), I still have a hard time paying the current rate for a hair cut. Here in Cincinnati a man’s cut runs between 12 and 20 bucks, plus the barber expects a healthy tip. Guess we are trying to catch up with the ladies as they have always had to pay pretty high rates. Most of my childhood a haircut was around buck. In fact most were outraged when it jumped to a buck and half. Guess it went the way of the 10 cent icecream cone (and a big one too) or the nickel candy bar. Now a childs cone is 2 bucks and candy bars are either so small they barely make a bite, or the cost so much you need a credit line to order one. And where in Chatt would one get a haircut today? The bar, fertilizer depot, or church? Perhaps from one of the Amish buggies visiting the bar? Do they give haircuts are the fire house? Is there a certain day of the week (month)? Is it a real barber or just a chair in the garage of the Caffee Insurance office? My Great Great Grandpa Samuel Leslie Riesen (1868 – 1941) operated a Barber Shop in Chatt from 1903-1917. He was a native of Adams County, Indiana where he owned a Barber Shop in Berne with his brother, Gideon, before moving to Chatt. (Your post about the Chatt Bar (Hotel) says the owner during this time was also from Berne). According to our family history, Sam’s family moved to Chatt in 1903 and 3 of his children were born there. The family moved to Celina in 1917 where Sam opened a Barber Shop at 223 S Main Street. His sons Gehrald and Vilas learned the trade in Chattanooga and his youngest son, Sammy, learned the trade in Celina at age 13 while Gehrald was serving in WWI. I would be very interested to know if you have any or could find any more information about this barber shop during these years. I will include the fact that it became a residential property in my family history, which I am updating now. Please reply to my response if possible and I thank you for this valuable information! This is so interesting and it certainly sounds as though your grandfather operated the barber shop on Chatt. It is great to put a name to the barber. I wrote what I know about the Chatt barber shop in the blog post, but if new information becomes available I will let you know. Thank you so much for writing and sharing this information. Thank you for your response Karen! I haven’t found any other information yet, but I will be happy to share anything else I do find.